If you have a business, it is quite obvious that you need to have yourself a website. Well, it’s quite obvious to me and it should be to you too. 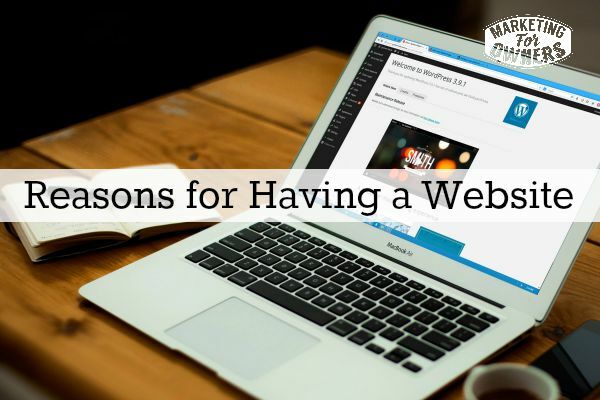 If you have a business, you need a website, but quite often people don’t think why they actually need one. Saying “I need a website because I have a business” isn’t enough. You need to think what it’s for. Now, I’ve always said that unless you are a government agency, there’s only two reasons to have a website and it should have a job. It should be like a sales person so that website should either make sales or get leads that lead to sales, one or other. They wouldn’t. If they’re looking at your website at 3 o’clock in the morning and you’re not going to be there answering the phone, they might think they’re going to call you the next day. But if they’re anything like me, by the time they’ve woken up, they’ve completely forgotten all about you. That’s the way it works with me. You need to be able to attract leads and in fact that’s what the whole perpetual sales cycle is all about. There’s core to it. But it’s a little bit more than that. How about your image? Your website gives you the opportunity to control your image and your brand. What I mean by that is that it gives a center for you to explain everything about you, your values, your products, your services, your history, and your future. Do you want others to go about putting out what they think about you online or do you want people to have the right opinion about your brand and your product? And of course, depending on what you do, someone might not like you. They could put out rumors they could spread. Others will then come to you to your website to look up to see if it’s true. That’s quite often how these things work. Believe me. In addition to that, customers want to look at you. They want to research you. They want to find out about you and if you don’t think they’re going to hop on the internet, you must be mad. That’s what they do. They’re going to look you up on Twitter, on Facebook, maybe on LinkedIn but they’re certainly going to do a Google search to find your website. So you need to control the message that they see. You need to know what you’re saying. You need to have modern news, modern information. You need to control what is said about you, about your company and about your brand. In addition, customers want to choose when they contact you. I said it before, if they’re looking– if it’s 3 o’clock in the morning and yes, some people work different hours — some people just choose to operate on a different time zone to the rest of us, and that’s fine. That’s the way it is. But if they want to contact you and ask you a question, if you haven’t got a website or if you haven’t got a contact form in your website, if you haven’t got an easy way to operate it, how are they going to do that? Do you think they’re going to pick up the phone and leave an answer phone message? That’s so old school. By the way, we operate pretty much 24/7. We don’t have a phone, so I don’t think you’ll have any way of leaving a message with us. I don’t think we have an answer phone or a voicemail. I don’t think so. I don’t even know. Isn’t that funny? In all my businesses, by the way, I would have to check that out but I’m pretty sure that you can’t leave voicemails. You either speak to someone or you get to leave a message. How about employees? If you want to attract good employees, do you think you’re the prize? They may be thinking they’re the prize. Now, if they’re good and if they know they’re good, they may have a choice of employers. So how about they look you up? How do you compare to others? That may influence their decision. Did you think about that? Yeah. Yeah. Exactly. Imagine if that was the reason is because your website was old-fashioned and they went to someone who you know is not as good as you just for that simple fact that you didn’t have it all planned out. This is your website. It’s so much more. It is a hub. It is a hub for your online activity, whether it’s marketing or anything. It is a place people are going to look for you. They may look it on Facebook but quite often they’re looking for a link to your website from Facebook. Website is the place it’s going to be. Personally, when I want to buy from someone, I look at their website for the things that I’m looking for. I want to know do they publish an address, do they publish a phone number. If they don’t have those it makes me think, “You aren’t getting my business because what are you hiding for?” I don’t want to phone you. I don’t want to write to you. I just want to know that you are not scared and you’re not hiding. But I also want to look up your latest news. I want to read your blog. I want to know your expertise and that’s where you’re going to get to demonstrate it. So consider that. A website is not just a brochure online. That doesn’t work. It doesn’t help anybody. Now, it is a Wednesday. 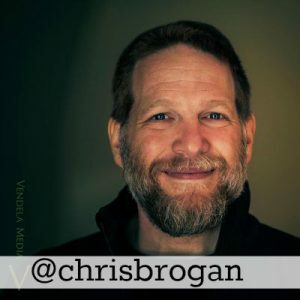 Time for a friendly follow and one person who does know a little bit about websites is our friend, Chris Brogan. 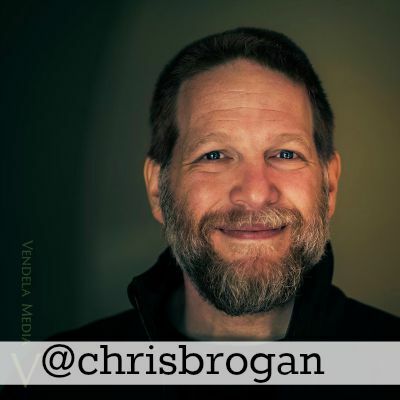 His twitter handle is simply @chrisbrogan. His website is chrisbrogan.com. Chris is a thought leader and he won’t say he is. He just says he reads a lot. He consumes books but he knows his stuff. He’s prolific, a blogger, speaker, author, fantastic social media expert. Last time I looked, over 300,000 followers but the guy is good. Go see what Chris Brogan is up to. Learn from him. See his tactics. Follow him. Emulate him. It’s all going to help and that’s what we’re after. Okay? That’s it for today. I’ll catch you tomorrow. Do you have a website yet? What’s holding you back?